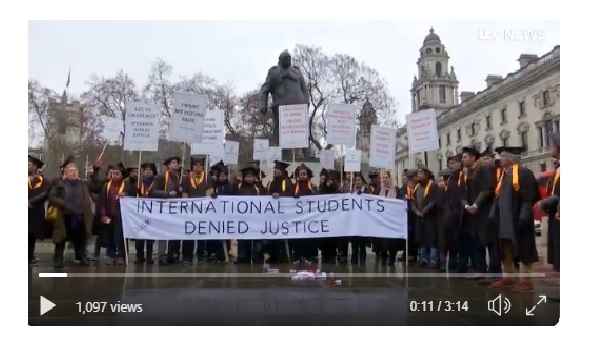 ITV London reported on our demonstration with the international students wrongly accused of cheating by the Home Office. Early on 24 January 2019, an ITV London crew, led by reporter Ria Chatterjee, arrived at the home of Rashel, one of the students affected by the wrongful allegations made in 2014. They spoke with him and later came down to the demo at Parliament, filming the protesting students and interviewing our Director, Nazek Ramadan. "I came here to learn business, not to be a victim," says Rashel in the report. "Because of this, I've just lost everything."